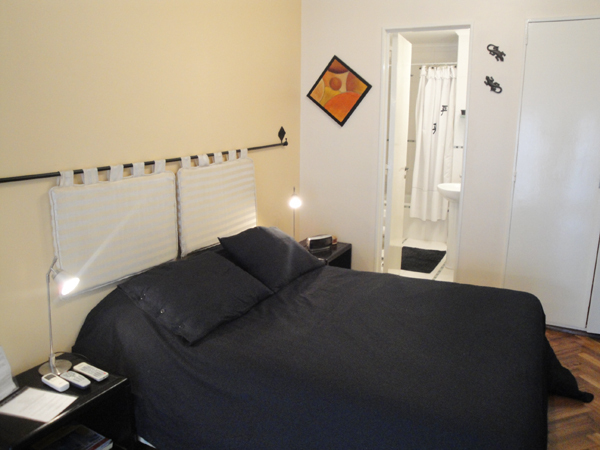 Very nice Studio apartment, cosy and quiet near the Plaza de Mayo, the Cabildo, the Casa Rosada and the area of San Telmo. This apartment offers a Queen size bed, a bathroom with shower. The living room area has a bar table with benches for two persons. The kitchen has a modern design and is fully equipped. Hardwood floor, Central heating, Air conditioning, Cable TV, Refrigerator, Microwave, Coffe Maker, Toaster, Kitchen utensils, Towels, Linens. City centre, metro station, bus stop, church, college, gym, solarium, restaurants, bars, nightlife area, shopping area, square, cinema, the house of parliament, the Cabildo, Obelisco, Historical place, lLundry, Parking Space, Tango school. Included: Electricity, gas, water, building fees, city taxes, cable TV, telephone.